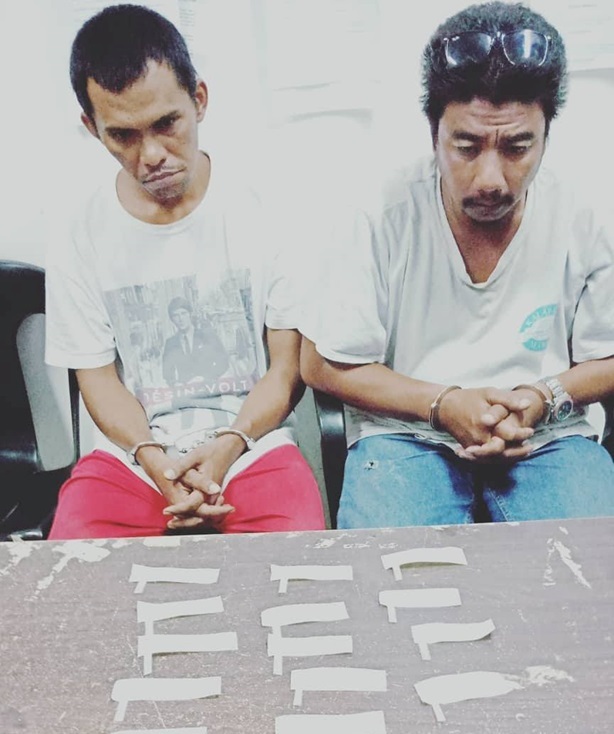 Junrey Canen and Ronel Capin were allegedly caught in possession of 15 packets of shabu during their arrest in Barangay Poblacion, Panglao on Saturday afternoon. Two alleged drug dealers were arrested Saturday by police in Panglao amid the Bohol Provincial Police Office’s continued drive against illegal drug activities. The men were apprehended after allegedly selling shabu to an undercover police officer during a drug buy-bust operation at 5:25 p.m. Authorities identified the suspects as Junrey Canen, a resident of Barangay Santa Cruz, Baclayon and Ronel Capin of Barangay Cogon in Tagbilaran City. Police allegedly spotted both men selling illegal drugs while riding a motorcycle in Purok 3, Barangay Poblacion in Panglao. This prompted operatives to set up the sting operation wherein they allegedly sold shabu worth P500 to a poseur-buyer. Police said that they found 15 more packets of suspected shabu in Capin’s possession after the arrest. The seized drugs were estimated to be worth P16,520.